Test Results for both HCM DNA Mutations (RD & MC) & PKD: Negative. Now introducing our breath-takingly gorgeous Ruby. 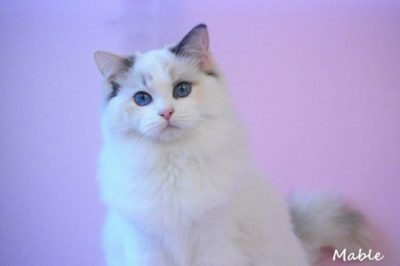 She came to us all of the way from our friend Miriam of RagdollsSong Cattery in Slovakia. She is perfect in all aspects… I am in awe. 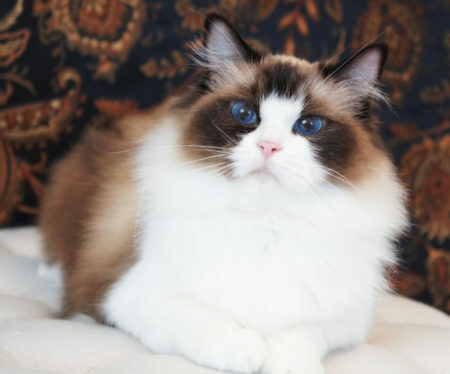 She is the epitome of a Ragdoll… Simply, she could not be improved. First of all, I must thank Denise Saunders of RegencyRags for allowing me the opportunity to take Naomi back home. In 2014, after the loss of our dear Hans to cancer, I made the decision after 12 years, I would be ending my cattery. I placed all of my cats who were to be my future breeders. To make a long story short, I placed Swag, as well as all of his offspring I intended to carry on with for future generations alongside my Hans and Apollo foundation line. In the Spring of 2014, our beautiful Naomi (“Simple Swanky Name”) was born. Her mother was our Della, who we had bought home from Denise Saunders a few years prior. As a gift to Denise, knowing she loved Swag, and for trusting me with Della, I sent Naomi to Denise to breed and cherish, which she did for many years. 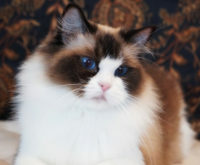 Denise was successful in producing quality in Naomi’s litters… with three going to on to join breeding programs and showing… one of Naomi’s sons is living in Europe, another in China. Denise graciously gave me the chance to bring Naomi home to obtain this line again, when I decided I would continue with a smaller breeding program. I am so thankful, as now we have Swag & Della’s line back in a perfect little package- our Naomi!! Naomi is stocky with a lot of “heft” to her. She has an absolutely flawless, textbook profile, perfect markings and to die for blue eyes, beautiful Seal coloring and a proper bunny coat. She’s a really nice blend of both of her parents. Naomi is also the full sibling of a wonderful stud in China, our lovely WillowTreeRags Lemon. Willow is a beautiful girl out of Honeybun & Apollo, she has all of our foundation lines in her. She has a huge, broad, heavy body and thick boning. She has a plush, semi-long bunny coat, big blue eyes, a super large and typey head for a girl. She is a fun, playful and smart girl. 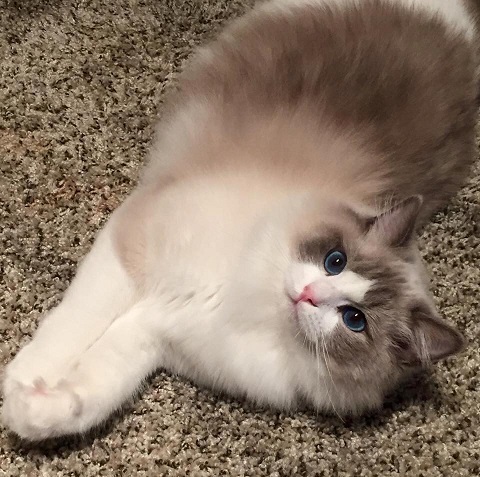 Our friend Carol Ann Ryan was sweet enough to offer Willow back to us, when she decided to end her cattery in Canada (JoJo Ragdolls). Since Honeybun has been retired from breeding, this was the answer to us continuing her line in our cattery, which we are so pleased to do. This line has really solid health and I’m thrilled she is here. She was never shown as her former owners did not show. Therefore, she will do her best work being a mother to her beautiful future kittens. Her forever boyfriend will be Hushy. Allow me the pleasure of introducing my enchantingly gorgeous, sweetheart of a doll- Rozyczka. Rozyczka flew over here all the way from her home country of Poland. Looking into Rozyczka’s eyes every day always brings me back to how taken back I was when I first laid my eyes upon this stunningly beautiful little kitten on the internet one afternoon. She instantly stole my heart, and I just had to make her mine! After reviewing her pedigree, it gave me a beautiful sign that this girl should in fact be MINE. Way back in the furthest generation I saw two familiar names. They were the names of my foundation stud’s mother’s parents. Bringing in a little piece of my foundation stud’s lineage back here meant so much to me, and Rozyczka was such a testament to generations of quality breeding. I was so excited that soon, I would be holding her in my arms! It was a cold December of 2013 when she arrived in Boston, after hours of flying. I don’t know who was more eager for the carrier door to open. I locked eyes with her just as the day I saw her for the very first time staring back at me from my computer screen. She has the biggest, bluest, most breathtakingly gorgeous eyes. I took her out of her carrier and squeezed her and told her I loved her so much! She just purred, and purred and purred. She loved me, too! It has been months since her arrival here, and Rozyczka and I have an incredible bond. Rozyczka loves me as much as I love her! She loves going to the shows, and making everyone “ooo” and “aww”. I am not the only one who is mesmerized by this beauty. 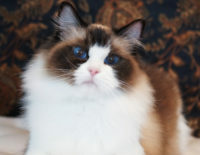 Rozcyzka had an extremely successful year in TICA showing as a kitten. 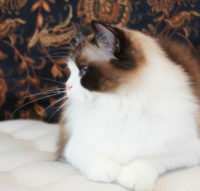 She is the Best Ragdoll Kitten in the Northeast Region, and is a Regional Winner in only a handful of shows. Rozyczka is now an adult, and she will be shown in TICA & CFA this Summer/Fall to achieve higher titles. My dream, from the first time I saw Rozcyzka was to breed her to Hans. Rozyczka’s first litter, will be Hans’ final litter here. I know regardless of when it happens, it will be well worth the wait. 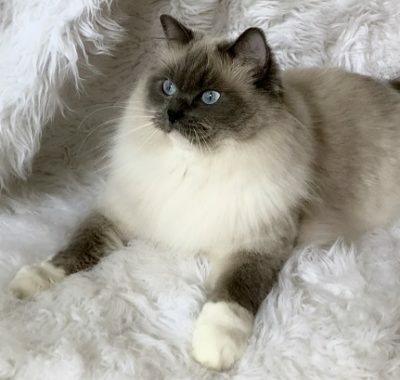 I cannot thank Rozyczka’s breeder Dominika Regulska of Supurrsonic Ragdolls for allowing me to own her beloved “Little Rose”. It was so clear to me when Rozyczka arrived that she had always been loved, pampered and well cared for before her arrival. I will be forever grateful to Dominika for sending me my beautiful Rozy. I still remember the conversations I had with Dominika before Rozyczka’s arrival here. She told me how sweet she was, and how truly beautiful, intense blue her eyes were… she did not exaggerate. I expected the best, and when Rozyczka arrived she was even more beautiful than I could ever fathom! What a truly remarkable and special girl. She is a cat who will never be duplicated. Dominika has truly given me more than I could have ever dreamed. She has the health, the beauty, and the personality. Rozyczka has produced some really nice kittens for us, among them are two wonderful breeding males living in China, TICA QGC. WillowTreeRags Adam of RenataKitty, and WillowTreeRags Blue Jay with our friend Malin who is just starting his show career!